The author Philip Ardagh,has been shortlisted for the 2013 Roald Dahl Funny Prize in the books for children aged 7-14 category. 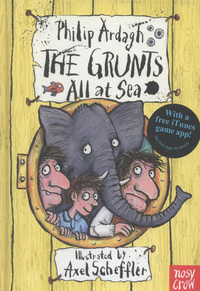 It’s one of the books in his new series about a family called The Grunts. He’s a previous winner is up against five other books. The other award is books for children aged six and under, and both awards carry a prize of £2,500. Schools across the UK are involved in the judging process and children’s votes are combined with the panel’s vote. The panel includes illustrator Sarah McIntyre and the chair is Michael Rosen . Michael created the prize in 2008 with Booktrust and the Literary Estate of Roald Dahl. This entry was posted in Book Reviews, Competitions and tagged Awards, Writing. Bookmark the permalink.